The Number One Arena Drag used at Olympics and World Cups for high performance and synthetic arena footings. Leveling, blending and light compacting in one easy step. The special Swivel trailering attachment makes tight turns maneuverable and keeps the arena footing even in corners and around jumps. Footing drag with hitch bar and optional 3 point for easy handling. Makes perfect grooming of your arena footing simple and fun. For gators, mules, ATVs and smaller tractors. 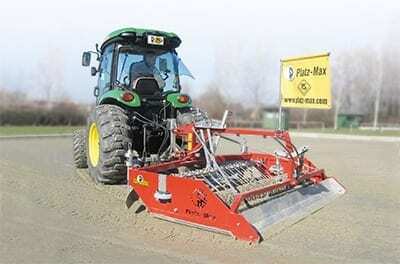 Efficiently grooms and waters your arena footing in a single time-saving pass. Assures even moisture in the arena footing while conserving water. Eliminates the use of uneven sprinkler systems and evaporation. 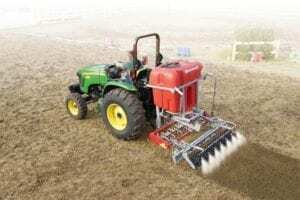 For competitions footings: The alternating activity of the heavy farm flex roller and the smooth bar enables maintenance of various surfaces with only one equipment. – Ideal for backing up to get close to the jumps and smooth out corners. Remember: Your arena footing is only as good as it’s maintenance. Platz-Max arena drags stand alone when it comes to how many Olympic and World Cup Events and competitors alike trust the precision-made arena equipment. Platz-Max arena drags have prepared riding surfaces for the World’s Champions over decades. German engineering is combined with craftsmanship to achieve high-performance arena drags. Choose among the most versatile models for your riding discipline to protect your investment in horse arena footing. The #1 drag for footing preparation at Olympics and World Cup Competitions. Our most popular arena drag blends additives like synthetic geo-textiles, rubber and wooden chips with riding arena sand. The Platz Max is the only arena drag on the market with a perfect leveling mechanism. The swinging blade levels the footing to the optimum, staggered coil tines erase hoof imprints while blending the additives. The high quality lattice roller with counter rotating discs evenly blends the textiles with the sand while slightly compacting the footing. Made in Germany. It is the ultimate high-tech blending and grooming tool to create and maintain an optimum riding surface. 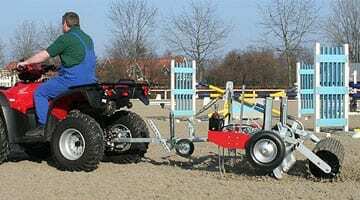 Footing drag for small Equestrian facilities with no tractor. Makes perfect grooming of your arena footing simple and fun. For gators, mules, ATVs, cars — easy handling. The Roll comes with all the same features as tractor models. Hydraulic hand pump for raising up the tires. Please note: For perfect leveling of the arena footing, the tires need to come up otherwise the tires will just follow the uneven arena surface and the leveling blade cannot efficiently work. Like with all the Platz-Max models, no shifting of arena footings in the turns and corners is guaranteed. Watering and dragging in one easy step! Versatile arena drag, economic performance with our Rain model. Assures even moisture in the arena footings while highly water conserving. Special diaphragm pump produces high volume pressure and can also be used in cold climates. The water tank system can be used with NL-GW, NLK models. 160 gallon water tanks available. Arena Drag for jumping arena footings, geo-textile footings, Ebb-and Flow arenas where additional compaction is needed. 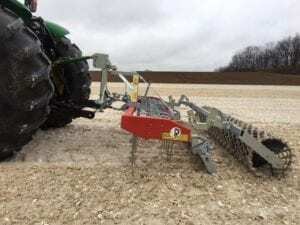 The swinging blade levels the footing, staggered coil tines in a 80 degree angle for ultimate blending of additives and the heavy farmflex roller adds firmness to the horse arena footing. Ideal for backing up to get close to the jumps and smooth out corners. Your arena footing is only as good as it’s maintenance.